Take a close look at that “generous” tenant improvement (TI) allowance that the owner of a new building has offered. What, exactly, is covered? While the amount may be larger than that offered by the landlord of an older building, a careful analysis might reveal that you will barely break even — and you may even have to pay out of pocket. For companies considering the cost of locating in a new building versus the cost of renovating space in an older building, it’s important to read the fine print – and make sure you’re not comparing apples to oranges. Contrary to popular perception, the cost of a build-out in a new building will run, on average, $14 per square foot more than the cost of a renovation — that’s a whopping $1.4 million on a 100,000-square-foot lease. Glimmering new construction has its appeal. Leasing office space in a newly constructed building gives you a rare opportunity to design your workplace from carpet to ceiling tiles. The catch? As one of the first tenants in the building, you risk bearing the brunt of the costs to complete the space unless you negotiate your IT allowance carefully. Not all TI allowances are created equal. Typically, you’ll need approximately $14 per square foot more to finish your space in a new building than renovating a ”used” space. That amount may sound high, but it includes the cost of drywall column build-outs, perimeter diffusers and soffit, power distribution panels, fire hose valve cabinets, after-hours hoisting expenses and more. Those costs should not be the tenant’s responsibility, but the project may turn out that way. Allow time to review your space and your lease before move-in. Carefully review the space and your lease to ensure that you’re getting a fair deal in terms of the space and the TI allowance. Consult early and often with the project team to review these conditions to confirm they can meet all your demands. For instance, a construction company that uses lean construction principles will provide built-in steps to keep you informed at every stage of the process and avoid onsite surprises. Look up and look down — carefully. Conflicting requirements for overhead infrastructure can make achieving high ceiling heights tricky. Nobody wants to visit their new space and find lower ceiling heights than expected— an unfortunate occurrence that is more common than one might realize. And, rarely is a floor as flat as promised. Trust the developer and base building general contractor — but verify the reality of what’s being built. Confirm that the building owners are on track to deliver the infrastructure needed for interior construction. Interior build-outs require power tools — and that means electrical power must be available in the newly constructed base building. And, you need permanent power, because heavy equipment can’t run on temporary power. If permanent power isn’t available as promised, work will not proceed. Also important, check the restroom turnover date. Otherwise, you’ll be funding the cost of temporary toilets for the construction crew. Don’t bring the outside in any longer than necessary — or risk adding an extra month to the schedule. 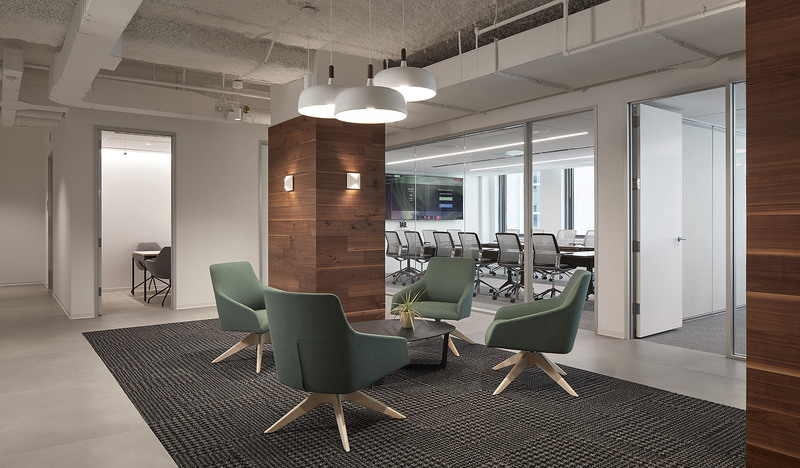 When the interior of a building is exposed to the elements, it collects moisture — and your interior finishes and flooring aren’t made for that. If interior moisture levels are high, the build-out will be delayed until the humidity falls. Furthermore, many environmentally friendly products don’t dry as quickly as traditional products. Excessive humidity only extends the construction schedule even further. The general contractor should test moisture levels before interior build-out begins. First, however, the building must be fully enclosed, with the HVAC system live. Coordinate large deliveries and installations carefully. Be sure to plan the delivery of larger supplies before the skip (debris container) and external elevators are removed. Similarly, you’ll need to allow time for testing fire alarms and elevator call buttons, and installing lamps. In Chicago, tenants aren’t allowed to relocate base building devices until the equipment being installed has been tested to meet building certificate of occupancy requirements. While many costs are unavoidable in an interior build-out, understanding construction needs, necessities and associated costs can help you negotiate a better deal with the landlord. Most important? Don’t ignore the fine print that may hide unpleasant surprises — and be sure to compare apples to other apples, not oranges. This article was authored by Skender Sr. Project Manager and Team Leader Ashlee Pforr, and originally published by NAIOP.